Brief：Peru is South America's fifth largest natural gas producer and could become a net exporter of crude oil by the year 2010. Peru is expecting US$ 6 billion to be invested in the oil and gas industries in the next four years through four major capital projects. The mining sector is one of the most important contributors to Peru's economy with exports in 2007 reaching US$ 15 billion and generating approximately 62% of Peru's total exports. Strong growth in this sector was attributable to high world commodity prices and sustained demand for jewellery and metals from India and China. Peru's mining industry has the potential for continued market growth due to a stable economic and political system, a well qualified labour force and the fact that less than 10% of Peru's natural resources have been developed to date. Investment in Peru's mining sector reached record levels in 2007 at more than US$ 3 billion and a further US$ 14 billion is expected to be invested in the mining sector in the next four years. The Cerro Corona gold and copper project in Cajamarca owned and operated by Gold Fields Ltd., a South African company, will require a total investment of US$ 350 million and will produce 164,000 ounces of gold and 28,000 metric tonnes of copper a year. Votorantim Metais, a Brazilian mining company, has already invested US$ 200 million in the expansion of the Cajamarquilla Zinc refinery plant in the region of Lima and will invest a further US$ 500 million in the project in the next two years. 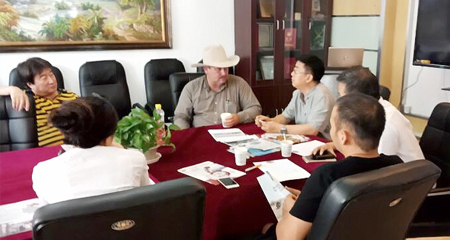 The Zijin Mining Group Co. Ltd. from China hopes to have the Rio Blanco project in the region of Piura in operation by 2011. The Rio Blanco mine could export as much as US$ 1 billion in copper a year for the next 20 years and will require an investment of US$ 1.44 billion. Southern Peru Copper, a Mexican mining company part of Grupo Mexico, plans to invest as much as US$ 4.4 billion by the year 2012 in five different mining operations located within four separate regions. Other important projected capital projects in the mining sector include the Quellaveco copper exploration project (US$ 1 billion) in the southern region of Moquegua owned by Anglo American and the IFC branch of the World Bank; the Toromocho copper project (US$ 1.5 billion) in the region of Junin owned by China's Corporation Chinalco; the La Granja copper exploration project (US$ 1 billion) in the region of Cajamarca owned by Rio Tinto; the Las Bambas project (US$ 1 billion) in the region of Apurimac owned by Xstrata Copper; the Michiquillay project (US$ 700 million) in the region of Cajamarca owned by Anglo American; and the Marcobre project (US$ 400 million) in the region of Ica owned by Chariot Resources, a Canadian company. Continued investment in Peru's mining sector will depend not only on sustained high prices for commodities but also on the mining investment climate. It is important for the government and mining companies to work together to engage in dialogue with rural and aboriginal communities where mining projects are located to demonstrate the benefits that mining can bring to a region in the form of infrastructure, employment and improvements in overall quality of life. Peru is South America's fifth largest natural gas producer and could become a net exporter of crude oil by the year 2010. Peru is expecting US$ 6 billion to be invested in the oil and gas industries in the next four years through four major capital projects. The Camisea Consortium, made up of five companies and headed by Pluspetrol, an Argentine company, plans to invest US$ 1.7 billion in the development and production of the Block 88 Camisea natural gas reserve located in the region of Cusco, 400 km southeast of Lima. The proven volume of gas in Block 88 is 8.7 trillion cubic feet (TCF), with an estimated ultimate recovery of 6.8 TCF of natural gas (recovery factor: 78 %) and 411 million barrels of associated natural gas liquids (propane, butane and condensate). The Camisea reserves are ten times greater than all other existing natural gas reserves in Peru. Camisea currently produces 500 million cubic feet of natural gas and 35,000 barrels of liquid natural gas a day. With this additional investment, Camisea plans to produce as much as 1.25 billion cubic feet of natural gas and 85,000 barrels of liquid natural gas a day by 2011. The Camisea 2 or Peru LNG project is run by a consortium of four companies of which Hunt Oil, an American oil company, is the majority owner at 50%. The project was created for the purpose of exporting excess Camisea reserves in liquid form to international markets. The project consists of three main parts: a liquefaction natural gas plant; a 400 kilometer pipeline connecting the plant with the upstream Camisea gas fields; and a marine terminal to export the liquefied gas by sea-faring tankers. The total cost of investment in the Peru LNG project is expected to reach US$ 3.8 billion and the plant, which is located south of Lima along the coast between Ca?ete and Chincha, is scheduled to begin commercial operations in 2010. Kuntur Transportadora de Gas, which is controlled by the American-based private equity investment firm Conduit Capital Partners, expects to sign a 30 year concession for its Gasoducto Andino del Sur gas pipeline project. The proposed pipeline would transport gas 1,085 km from Camisea in Cusco to the port of Ilo in the southern region of Moquegua. The project will require an investment of US$ 800 million. It will benefit more than 1.7 million residents, supply energy to power and petrochemical plants and provide energy to 30 small to medium size enterprises (SMEs). Construction is due to start in 2010 and commercial operations are planned to begin in 2012 and cities along the pipeline's route including Cusco and Puno could receive gas in 2011. Kuntur is in talks with various companies interested in partnering on the project including the Brazilian company Odebrecht, and Colombian Promigas. The Peruvian government has decided that the pipeline will follow the route proposed by Kuntur through the Andes. Peru is currently a net importer of oil. However, the expansion and modernization of the Talara oil refinery in northern Peru could help Peru become a net exporter of oil by 2010. Petroperu, Peru's state owned oil and gas company, will be awarding the US$ 1 billion project through a bidding process that has already begun. The modernization of the Talara refinery aims to increase the production capacity from 62,000 barrels a day to 90,000 barrels a day, optimize the fuel quality at existing units and to construct new, more efficient units. Perenco, a French oil and gas company, plans to invest US$ 1.9 billion into Block 67 located in the Mara?on jungle basin in the region of Loreto. Block 67 is estimated to contain over 300 million barrels of heavy crude oil and have the capacity to produce up to 100,000 barrels of oil per day. Perenco's investment plans call for drilling, the construction of surface processing facilities and local pipelines for delivery of crude oil into the export pipeline system. In addition, the export pipeline system will require upgrading in a separate project.